On any microcontroller, timers are arguably one of the most useful peripherals, probably along with GPIO. What is a microcontroller without the ability to measure time reasonably accurately?! Timers on the STM32 series of chips are quite complex and will be spread across multiple tutorials, each hopefully demonstrating one useful section of timers. The tutorial today will simply be on setting up the timer and using its count value for something. I will be flashing the two on board LED’s with the pulse cycle time dependent on the timer and the pulse width dependent on a variable. Most people generally use timers to create a constant timebase as a division of the clock frequency. 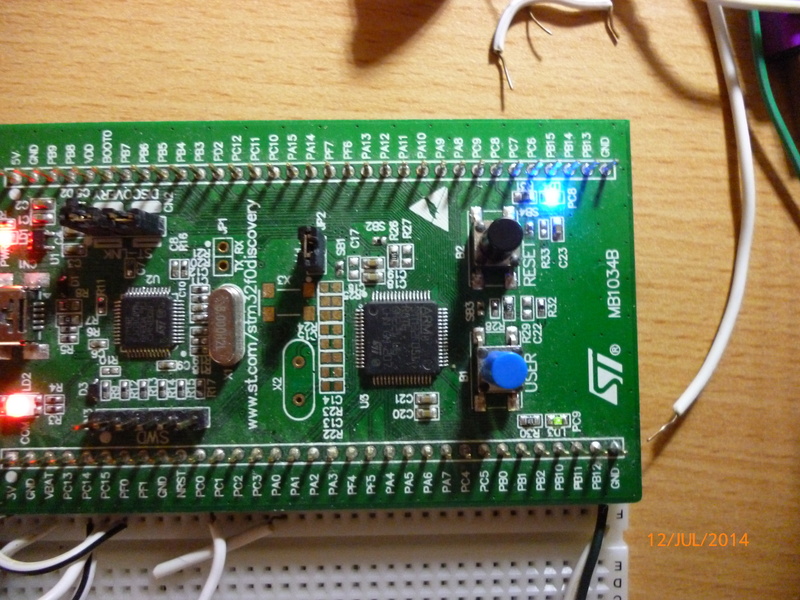 The timers in the STM32 chips have much more functionality and can be used from triggering internal peripherals (such as the DAC) to creating PWM signals in hardware. In a future tutorial, I will explain how to set up a timer with a timer update interrupt, manually creating pulse a pulse width modulation source. Once these libraries have been included, you can start with the coding! As per usual, include the libraries you will be using in the main file. 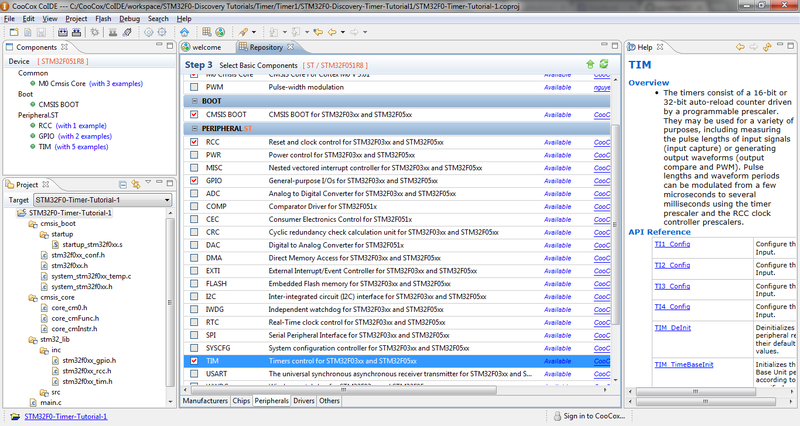 All three of these libraries are required to use the timer functionality on an STM32F0 chip. Next, state all the definitions of the program, along with initializing the standard peripheral library structs. As per usual, I have defined the GPIO pins used for the onboard LED’s, along with the value that specifies the pulse width of the timer. Later on, you will see that LEDToggleValue is used to set the time that the green LED is on vs the blue LED out of a total value of 65535. With this value set to 3000, the green LED will be on (3000*100/65535 = 4.6)% of the time. The first struct GPIO_InitTypeDef LEDs is required to store all the information about the GPIO. TIM_TimeBaseInitTypeDef TTB is a structure which stores all the information about the timebase parameters of the timer. These timebase parameters set the speed that the timer runs at, along with the direction it counts to/from. In this example, the timer will be counting upwards from 0. Now to the main code! In the main code, the system core clock is initialized, the clock to GPIOC is enabled, along with the clock for TIM1. Next, the LED gpio is initialized, like in the first tutorial! Both the blue and green LED’s are set as outputs. The above code uses the definitions found at the start of the file. Now that the GPIO and clocks have been sorted, we can get on with setting up the fun stuff – The timer timebase! Using this, I can calculate how fast the LED’s are toggling. So, as well as having a dedicated prescaler, the clock to the timer can be divided even more by setting the value for TTB.TIM_ClockDivision. In this example however, I’m setting this divider to 1. As stated earlier, the timer will be counting upwards, as set by: TTB.TIM_CounterMode = TIM_CounterMode_Up. The maximum period of all the timers is 65535 due to the 16bit limitation. The prescaler also is limited to 65535 as this is 16bits too. This therefore means that the slowest speed that the timer can update is 0.0026Hz (achieved by also setting the clock division to divide by 4). 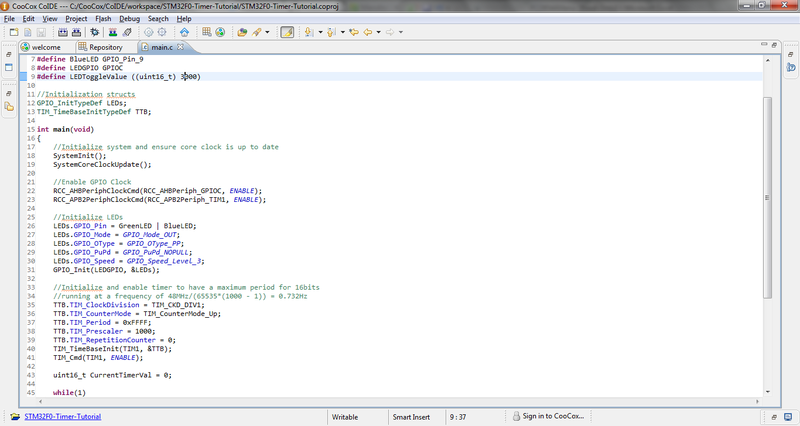 The timer parameters are initialized into the timer register using TIM_TimeBaseInit(TIM1, &TTB);. The timer is also started using TIM_Cmd(TIM1, ENABLE);. Subsequently, the timer can also be stopped by disabling it. If you’ve managed to compile this correctly, you should see the LED’s flashing with the blue LED being on significantly longer than the green LED. I’ll include a picture but as with most things, its quite hard to tell if its working because a photograph is static! STM32F0 discovery connected to my trusty breadboard! Ignore the wires below, they’re not related. As you can see, setting up the timer as a constant timebase and using the count value is really easy to do and if you’ve managed to get this far, you’ll easily be able to use the timers to more functionality! The final code! If you want to maximise your current window in CooCox, double click on the tab at the top. In this case, I double clicked main.c. To exit the fully windowed mode, just double click again! As with all my tutorials, this can be found on my github! Very good tutorial, so when do you release the nest timer tutorial? I have just move from ATMEGA8 to STM32F0, so the timer of STM32 is complex when compare with ATMEGA.Can you make a full tutorial to use Advanced TIMER 1 of STM32F0, how to interrupt using TIM1 (upcounter, downcounter and center), how to make a PWM with it? Hi, I need 1 Mhz timer interrupt. Is it possible? Yes and no! Depending on which timer you’re using, along with what speed your processor is running at, 1MHz can be generated by the timers easily, the problem comes with what you will be doing in your interrupt. 1Mhz leaves 48 cycles if your processor is running at 48MHz, where that includes entering the interrupt, executing your code, leaving the interrupt and restoring the stack! I can’t imagine you’d have much time to do much else. What would you be doing inside of the interrupt? Depending on your application, you might be able to use DMA to slacken your requirements (for example, collecting ADC samples).